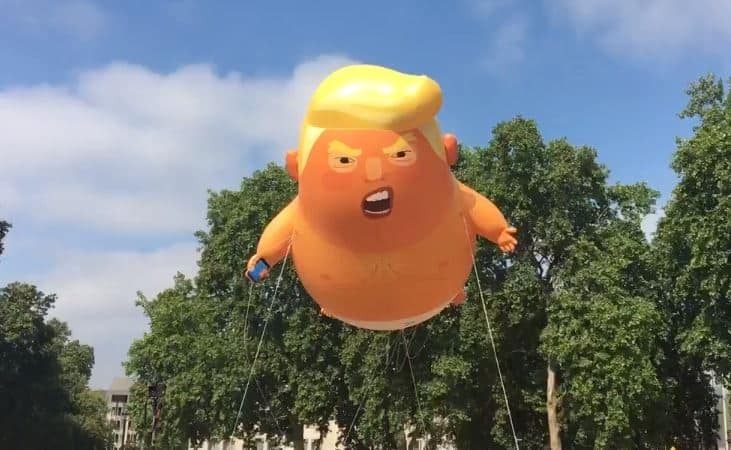 Remember the inflatable Baby Trump that flew over London as the President made his first visit to the UK, among much outrage from conservatives? Since Trump’s London visit, his baby likeness has greeted him across the world. 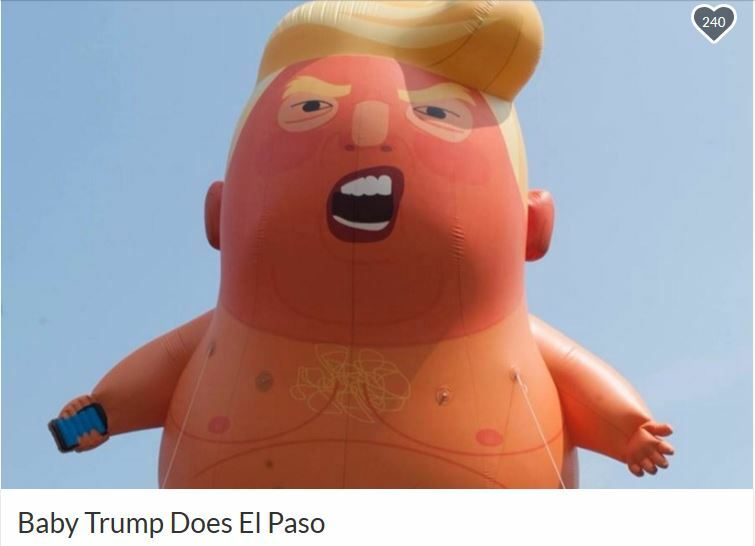 Today protestors take to the streets at the President’s first campaign rally of the year, as he visits El Paso, Texas. Many locals are infuriated by Donald Trump talking up the dangers of living near the border with Mexico and demonising Mexicans as a threat. Joining locals on a rally will be the 6-metre-tall baby Donald Trump blimp. 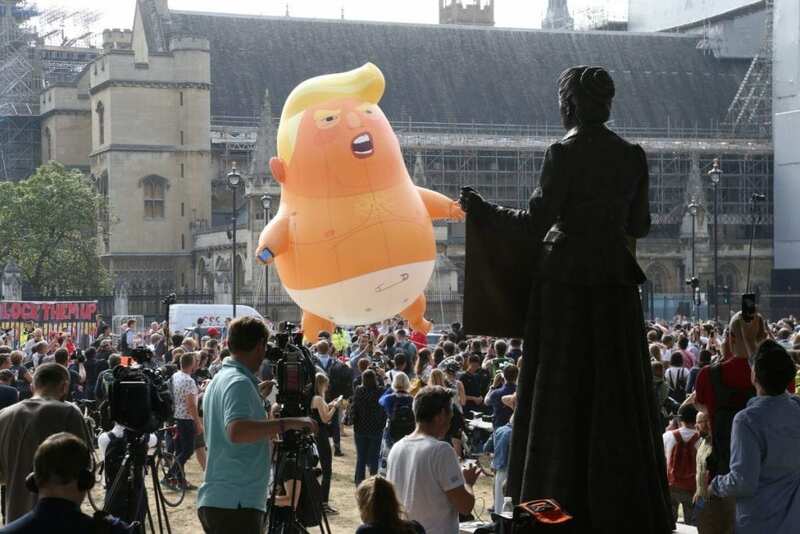 “Fragile, like his ego,” the baby Trump-a-like was first flown as protests greeted the President’s visit to the UK on July 13. Baby Trump went on tour after and has flown in Edinburgh, in Paris, Buenos Aires at the G20 summit, continuing to stalk the president until campaigners exhaust their funds. A GoFundMe page, set up by activist Laura Valdez, exceeded its $3,500 goal to bring the blimp to today’s rally in Texas in just one day, with any extra money donated to charities helping the homeless and immigrants. Local Republican Congresswoman Veronica Escobar has written to the President, demanding an apology for the president’s “outright lies” and “cheap attempts to use our community as a political prop”. Trump is holding a rally there today as he threatens to seize the billions of dollars required to build the wall that he promised his supporters in his election campaign across the border between the US and Mexico without the permission of Congress.